Prepare for your future career and succeed on the ASE certification test with TODAY’S TECHNICIAN: AUTOMATIC TRANSMISSIONS AND TRANSAXLES, 6e. You’ll find practical, easy-to-understand coverage of a wide range of must-know topics that adhere to 2013 NATEF AST/MAST program standards, including continuously variable transmissions (CVT), drivelines for front-wheel drive (FWD) and four-wheel drive (4WD) vehicles, as well as the latest information on today’s high-tech electronic controls and automatic shifting devices. The book’s technician-oriented focus helps you master the design, construction, troubleshooting techniques, and service procedures you’ll need on the job. The Classroom Manual provides easy-to-understand coverage of every topic on the ASE certification test, while the Shop Manual includes job sheets that get you involved in performing hands-on service and repair tasks. 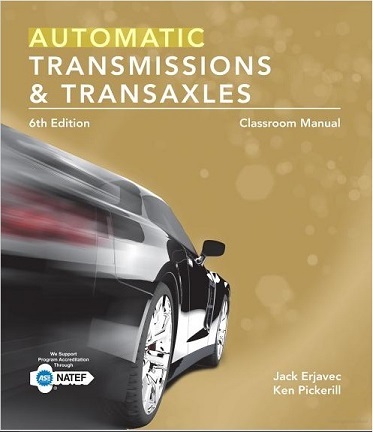 The book provides the most complete and up-to-date information on automatic transmission theory, diagnosis, and repair available in a single source. Extensive illustrations and step-by-step photo sequences include all major automatic transmission repair procedures and promote professional work practices. Extensive information guides students in rebuilding and design of most major transmissions from Ford, GM, Chrysler, Toyota, and Nissan. Coverage of hybrid vehicle transmission designs, the Lepelletier gear setup, power split units, various continuously variable transmission (CVT) designs, and electronic control systems prepares students for successful on-the-job performance. Job Sheets in the Shop Manual help students perform common service procedures. A comprehensive Spanish/English glossary and inclusion of J11930 terminology help students master key terms, concepts, and skills. Each chapter ends with a Summary and Review Questions to help students gauge their mastery of the content. ASE-Style Review Questions and ASE Challenge Questions in the Shop Manual and an ASE Practice Text in Appendix A help students prepare for the ASE certification exam. 3. General Theories of Operation. 6. Torque Converters and Oil Pumps. 7. Hydraulic and Electronic Controls. 9. Reaction And Friction Units. 3. Diagnosis, Maintenance, and Basic Adjustments. 4. Electrical and Electronic System Diagnosis and Service. 6. Torque Converter and Oil Pump Service. 7. General Hydraulic System Service. 8. Gear and Shaft Service. 9. Friction And Reaction Unit Service. Appendix A: ASE Practice Examination. Appendix B: Automatic Transmission Special Tool Suppliers.